DEB FRISCH TRUMPETS HER VIOLATION OF PROBATION!! 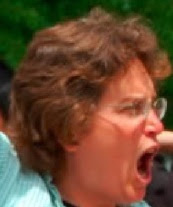 Eugene (Tax Day 2010)--Unless events intervene, Deborah Frisch is scheduled to be deposed today by Eugene City counsel. Teh topic of teh deposition, prompted by DumDeb's quickly dying frivolous lolsuit, will be Frisch's drunken behavior near teh John Henry bar on Nov 2 2008. Frisch's antics that night later culminated in her criminal conviction last spring and a 3-year probation sentence. Meanwhile, Debbie continues to shriek over Hot Flash Dance organizers' standing up to her bullying last Saturday. Frisch, trying to violate her probation, attempted to enter a dance held at The City bar and night club. "It was the most indecent and offensive behavior I've ever witnessed," recalled teh witness, "Little Deb's...onslaught of vulgarities and hate- mouthing of the dance organizer and the owner of The City Nightclub ...continued for well over 5 minutes....I couldn't even get in the door with her big mouth and arms flailing about. Her face was beet red and she looked as if she would have an aneurysm at any moment." Any word on how the deposition went? Apparently, she didn't bother to show up.